With From Software’s Dark Souls series rising to fame, we have seen plenty of other titles offering unique spins on its formula, such as Team Ninja’s Nioh and Deck13’s The Surge. Death’s Gambit by White Rabbit is among these titles a game that doesn’t stray too far from the From Software developed series’ formula but it is quite enjoyable nonetheless. 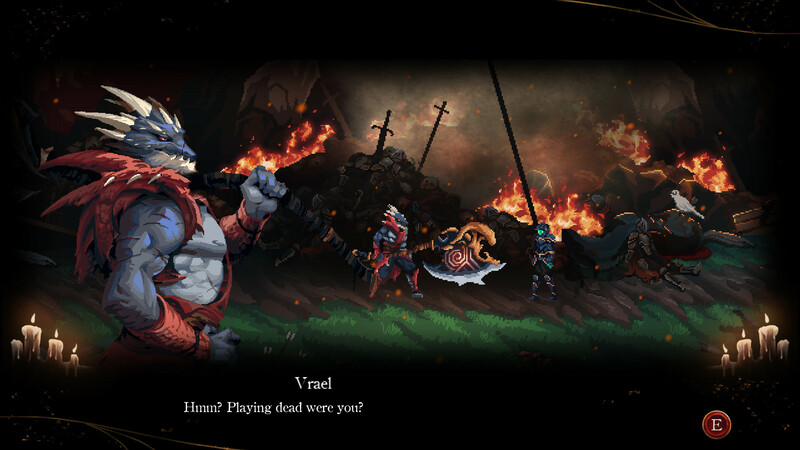 In Death’s Gambit, players take on the role of a powerful warrior who has recently died alongside his soldiers. Right after getting revived, he is greeted by a mysterious creature called Vrael, who tells the protagonist to get back to Vados and do his duty. Soon after, Death itself makes its appearance, binding the warrior with a contract and keeping him alive until he completes his duty. From there on, the warrior will make a journey into dangerous lands, seeking the secret of immortality at the heart of Siradon, challenging the immortal guardians of the realm. Death’s Gambit’s story is definitely enjoyable, mostly thanks to the way it is told. While it may be hard to follow at times, in true Souls series fashion, there are some dream-like sequences which go deeper into the main character’s backstory. Some of these sequences, which can only be viewed by dying, also provide some additional details on the area the player died in. The story is also made better by the beautiful atmosphere of the whole game, which is more melancholic rather than dark. While Death’s Gambit tried to do something different from the Souls series in terms of storytelling, the gameplay formula is pretty much a replica of the series by From Software, not counting the jump from 3D to 2D. At the beginning of the game, players will be able to choose a class, which determines beginning stats and weapons. These are in no way binding, as players will be able to customize the character in any way they want through the course of the game by leveling up. Like in the Souls series, leveling up can only be done in specific locations and by using specific amounts of shards, obtained by defeating enemies. No matter the chosen class, players are able to use any weapon they find during the course of the game, granted they have high enough stats. 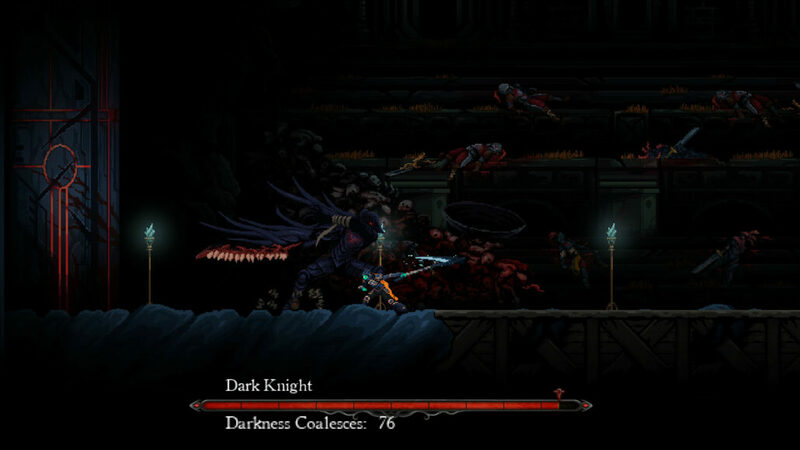 Death’s Gambit also features weapon-specific skills, which can be used with the right amount of energy. Don’t expect to spam them to death, literally, as they all come with a cooldown timer. While most mechanics resemble the Souls series’ ones, there are some important differences. Unlike the From Software games, all of the available classes do come with some differences, namely in the Talent Tree. Upon defeating bosses, players obtain Talent Points, which can be used to unlock different abilities. The abilities system also works in an interesting way, which favors an aggressive playstyle, as energy depletes some time after the player stops attacking, and hitting, enemies. Higher energy level also results in a decreased cooldown for all equipped abilities, which are powerful enough to make a difference during boss battles. Like the Souls series, Death’s Gambit is brutally difficult, especially during the first playthrough. Regular enemies hit hard and bosses hit even harder, unleashing some unique attacks that are signaled by skull icons. Unfortunately, boss design is a bit hit and miss: some are incredibly fun and require real skill to defeat, others, however, are definitely lacking. A shame, as the best bosses are very, very interesting. Expect also to die several times due to traps which may be difficult to avoid the first few times they are encountered. As mentioned above, players will die a lot during the course of the game, and something will be lost each time. Unlike the Souls series, shards aren’t lost with each death, as players will only drop a single Plume unit, the game’s main healing item, which can be recovered by reaching the point where the death happened. Plumes can also be recovered by paying a rising amount of shards at Death’s Shrines. The Plume mechanics are also made interesting by the fact that a single unit can be sacrificed for increased damage. Dying against bosses is also less of an issue than in Souls games, and not just for the fact that shards aren’t lost, as players are awarded them depending on their performance: the more the boss has been damaged, the more shards are given. Death’s Gambit exploration is definitely interesting, leaving players freedom in which order to complete the different areas. The game’s main hub, called The Central Sanctuary, reached after defeating the first boss, features a few merchants as well as teachers that allow players to purchase abilities and spells. Players also have the chance to lead other NPCs to the Sanctuary, expanding its functionality. 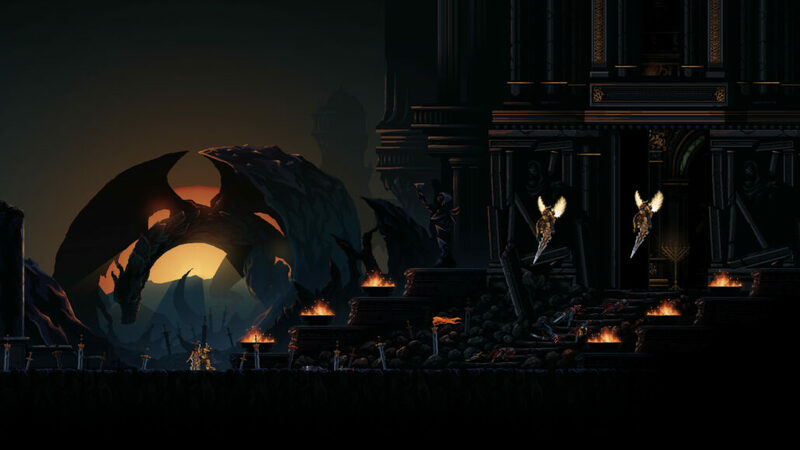 From the Sanctuary, players can explore a variety of areas featuring different regular enemies and one of the bosses. Areas are designed well, from the most part, but don’t expect a particularly open design, as they fell pretty linear, despite some branching here and there: all paths, eventually, lead back to the Central Sanctuary. Thorough exploration also rewards players in several ways, allowing them to obtain new weapons and items as well as lore books which provide damage bonuses against bosses. Playing well and not using the Plume to heal also allows players to unlock special chests that cannot be opened otherwise. Despite some interesting mechanics, Death’s Gambit does have some flaws that damage the experience. For starters, combat isn’t as precise as it should be in this type of game, due to some weird hitboxes for some weapon types. The movement also feels floaty at times, so it may take some time to adjust to it and avoid unnecessary deaths. Controls also take some time to get used to, coming from the Souls game or other Metroidvania games, especially the climbing mechanics, which require an additional button press never seen before in other similar games. Death’s Gambit’s presentation is definitely one of its best features. The 2D sprites are beautiful to look at and are well animated, giving everything a unique feel. Areas aren’t particularly original as far as themes are concerned, but they look as beautiful as the sprites. Everything is made even better by the excellent soundtrack, with some beautiful piano pieces which enhance the melancholic feel of the game. The PC version of the game runs quite well on a machine featuring an i7-3770 CPU, GTX 980 Ti CPU, and 16 GB RAM, but the low system requirements should allow Death’s Gambit to run nicely on most modern systems. There are, however, some bugs and crashes, but the team is working to address them. Death’s Gambit doesn’t stray too much from the Dark Souls formula, but it’s still a very enjoyable experience, thanks to its beautiful presentation, outstanding soundtrack, and atmosphere. A few flaws here and there, however, prevent the game from being a masterpiece, but a few tweaks here and there could make a potential sequel a game to remember.